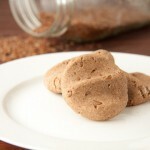 These simple low fat, low calorie, vegan cookies are the perfect mid-day treat! Our favorite way to enjoy them is dipped in cinnamon apple sauce. In large bowl, whisk together dry ingredients. Add wet ingredients and mix until fully incorporated. Roll by scant tablespoons into balls. Place 1-inch apart on prepared baking sheet. To flatten with a wavy impression, press down on each ball with your index and middle fingers slightly apart like a peace sign. Bake until bottoms are golden, about 12 to 14 minutes. Cool 5 minutes on sheets; transfer to wire racks to cool completely. a combination of other flours can be used but I have not tested. 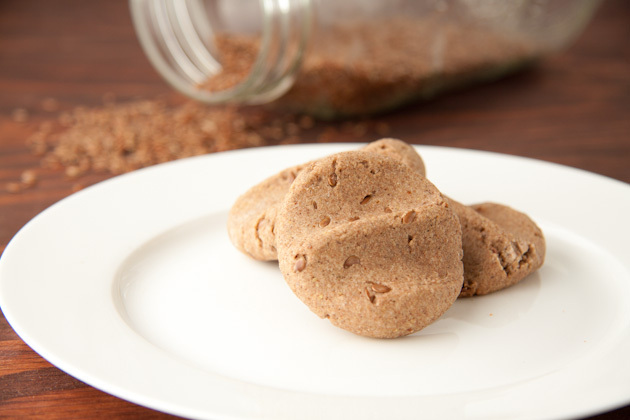 Tapioca or sweet rice flour could replace the arrowroot powder, and brown rice or chickpea flour can replace the teff or buckwheat.